Woe to the poor gamer who slid the floppy for Infocom’s computer adventure game adaptation of Douglas Adams’ seminal book The Hitchhiker’s Guide to the Galaxy into their unsuspecting drive. Not because it was a bad game; it wasn’t. Unless you mean bad as evil. Then it was very, very bad, indeed. Adams was an early technophile, quickly falling in love with the Apple II, and subsequently with Apple’s revolutionary Macintosh computer. He was also fond of Infocom’s adventure games, and signed a multi-game deal with the company in early 1984. Paired with famed Infocom game implementer Steve Meretzky, the two banged out the Hitchhiker’s game over a six month period; Adams writing passages in England and emailing them to Meretzky in Cambridge, MA. Meretzky ended up having to chase famous procrastinator Adams down to a remote British resort to finish work on the game. Upon release in late 1984, The Hitchhiker’s Guide to the Galaxy was a huge hit, moving over a quarter of a million copies. Breaking many cardinal rules then established in interactive fiction, it also caused a million hairs to be pulled out by frustrated gamers. Transgressions included outright lying to the player about available directions to travel in, and even what the player was able to see. It also often required players to have read the book to know what to do in certain situations. Perhaps worst of all, a favourite torture of Adams was to let you miss some critical piece of equipment during a scene that would cause the game to dead-end later, with no recourse but to reload a save or replay the game. At times it seemed that Hitchhiker’s was purposefully created as a ploy by Infocom to sell more of their Invisiclue hint books. These brutalities aside, Hitchhiker’s is still an entertaining and interactive excursion through one of the greatest science fiction comedies of all time. For more information on Hitchhiker’s and Infocom, consult your local Dot Eaters Bitstory. This entry was posted in 1984, adventure game, Douglas Adams, Infocom, interactive fiction, Steve Meretzky, text adventure on August 13, 2015 by William. 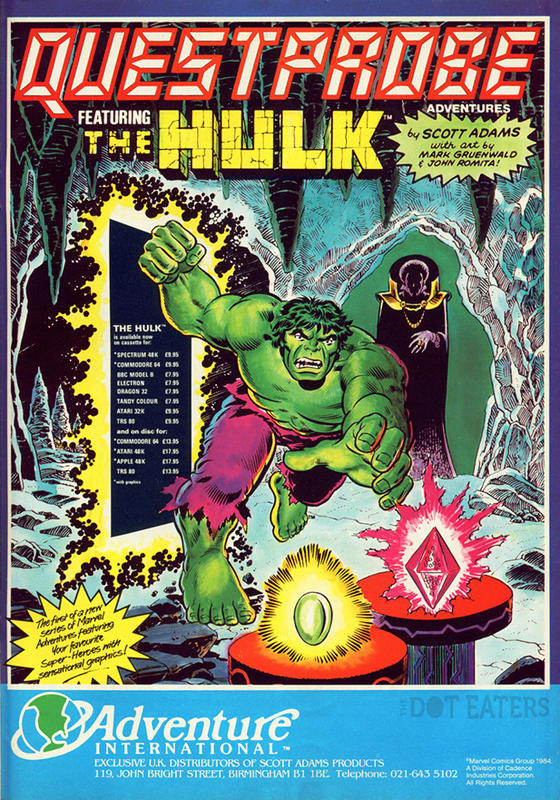 This entry was posted in 1984, adventure game, Adventure International, comic, Marvel, Scott Adams on June 29, 2015 by William. July 13th was the 30th Anniversary of the release of The Last Starfighter to theatres. How times flies while you’re saving the universe. TLS was a bit of bubble-gum pop cinema about young teenaged handyman Alex Rogan, played by film newcomer Lance Guest, spending his days keeping the Starlite Starbrite trailer park together. Denied a student loan needed to attend college, Rogan’s only escape from his plight is obsessively playing an arcade game called Starfighter, installed at the park’s snack bar. With the park’s populace gathered behind him cheering one night, he breaks the record on the game. Later he is approached by the game’s inventor, played by Robert Preston. This man turns out to be a con-man from outer space named Centauri, who wisks Alex away to be conscripted to fight in defense against encroaching tyrants. At first refusing this invitation, an assassination attempt convinces Rogan he might be his world’s, and indeed the universe’s, only hope for freedom. Joining Guest and Preston is 80’s sweetheart Catherine Mary Stewart as Rogan’s love-interest Maggie, along with veteran character actor Dan O’Herlihy as fan-favourite Grig, the lizardly pilot who is part wise mentor and part comic-relief. Another star of the show is the Gunstar, a lethal spaceship created entirely by computers. TLS picks up the baton where Tron left off, featuring the most CGI in a film up to that point. With 27 minutes of photo-realistic computer effects, the movie helped further the technology down the road towards becoming standard practise in filmmaking. The movie didn’t exactly burn up the box-office when it was released on July 13, 1984. However, the lasting effect it had on moviemaking technology, along with sterling performances from Preston and O’Herlihy, makes it an important and charming ride through the stars with Alex, Centauri and Grig. For a complete history on the making of The Last Starfighter, consult your local Dot Eaters entry. This entry was posted in 1984, movies, The Last Starfighter on July 16, 2014 by William. The 7800 was Atari’s follow-up to the 5200 Supersystem, and was originally announced in 1984. Unfortunately, when ex-Commodore head Jack Tramiel took over the consumer division of Atari that year, he froze almost all video game projects to focus instead on the company’s 16-bit computer line. While the 7800 might have been a force to be reckoned with in 1984, the video game landscape had changed substantially by its eventual release in 1986, and Atari’s console struggled to make an impact in a market where heavyweights Nintendo and Sega were duking it out. The ProSystem sold over 3.5 million units in four years, and produced some pretty good home translations of arcade hits like Dig Dug and Xenophobe. The gaming world, however, had moved on to the sprawling, original worlds of Super Mario Bros..For more on the history of the Atari 7800 ProSystem, consult your local Dot Eaters article. This entry was posted in 1984, 1986, atari 7800, Jack Tramiel on November 8, 2013 by William.